Giving a clean chit to Alwar SP M N Dinesh, arrested in connection with a fake encounter in Gujarat, the Rajasthan government today said the police official was not present at the site of the shootout. Three IPS officers arrested on charges of killing a man described as a Lashkar-e-Toiba cadre in a fake encounter in 2005 were today remanded in police custody till May 1. The CPM today attacked the Narendra Modi led Gujarat government over the fake encounter case stating that its “shameful communal stance provides cover to delinquent police officers to kill innocents” and demanded a CBI probe into the entire episode. The Indian Navy is on full alert and totally geared up to thwart any possible attacks by the Liberation Tigers of Tamil Eelam (LTTE) or any other forces in the Bay of Bengal off the Tamil Nadu coast, said Commodore Peter E. Vanhaltren. The month-long second phase of Parliament’s Budget session beginning from tomorrow will witness heated debate between the treasury and Opposition benches on OBC and human trafficking while the ruling UPA will try to get the Finance Bill 2007-2008 approved on May 3. Don’t place your trust in a political party that does not believe that the most vulnerable sections of society need special help - this was the acid test spelt out by Congress president Sonia Gandhi for the Uttar Pradesh voters today. As the Congress rivals attack her family for perpetrating dynastic politics, Priyanka Gandhi is ready to let go of her famous maiden name. The Centre today urged the Supreme Court to grant it permission for releasing the subsidy for Haj pilgrims this year too as the travel facilities have to be settled in advance with the Saudi Arabia Government and linked it to the expenses incurred on the arrangements for Kailash Mansarovar pilgrims. Telecom operators may face a penalty of minimum Rs 1,000 for each unverified subscriber, communication and IT minister Dayanidhi Maran said here today. ''We will impose Rs 1,000 penalty per subscriber on telcos for the non-compliance of TRAI's order for verification of customers identity,'' Maran told reporters. Three years after he took over as Chief Minister of Andhra Pradesh, Y.S. Rajasekhara Reddy has finally decided on Cabinet expansion. The Coordination Centre on Naxalism will meet here tomorrow amidst reports of a shift in strategy by the Left Wing extremists leading to high casualties. While the wage boards for journalists and non-journalists will be in place in the next few days, the Employees Provident Fund Board will meet next month to finalise the interest rate for 2006-07 and 2007-08 fiscal, said Union Labour Minister Oscar Fernandes said today. The Central Information Commission (CIC) has reserved its order on senior IFS officer Veena Sikri's demand for information about the process of appointing foreign secretary Shiv Shankar Menon. Former Prime Minister of Pakistan Occupied Kashmir Sardar Abdul Qayoom Khan, who is currently in the Capital to attend a conference over the weekend, has a grievance that he was not invited for the third roundtable conference chaired by Prime Minister Manmohan Singh yesterday. The BJP’s demand for a debate in Parliament on Rs 2 coin allegedly carrying a cross found no takers at a meeting of the NDA today. A special team of the Delhi police found an incriminating evidence in connection with the Katara human trafficking case from a city-based Cloud Nine travel agency during raids last night. Delhi Police has got information on 12 people who travelled abroad on diplomatic passports issued to MPs and their families, a senior official said on Wednesday. Over 1.50 lakh extra berths have been provided in 78 summer special trains, which will be running during the coming summer holidays from Howrah and Sealdah to New Delhi, Amritsar, Pathankot, Jaipur and Dehra Dun. A memorandum of understanding has been signed between Satluj Jal Vidyut Nigam Ltd (SJVNL), a joint venture of the Union Government and the Himachal Government, and Konkan Railway Corporation Limited (KRCL). Time to convert talk into actions says PM. Govt. committed to uplifting Muslims, says Sonia. Kalam will address mercy petition of Afzal when it comes to him. Home minister Gulab Chand Kataria, who is leading an official delegation comprising home secretary V.S. Singh and DGP A S Gill to Gujarat, told UNI over the phone that they have expressed their displeasure to the Gujarat administration as the arrest was made without prior information to them. Kataria wondered why the SP was made one of the main accused in the case. He said though the police official was in Ahmedabad that day, he was not present at the site of the encounter. He said the state government would provide all legal assistance to the beleaguered police official. The Alwar SP was arrested along with DIG D.G. 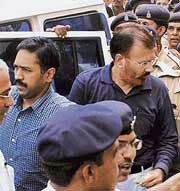 Vanzara and SP Rajkumar Pandian of the Gujarat police for his alleged involvement in a fake encounter of Sohrabuddin Sheikh in November 2005 in Ahmedabad. Deputy inspector-general, Gujarat(Border Range) D.G. Vanjhara,SP, Intelligence Bureau, R.K. Pandian and Rajasthan IPS officer Dinesh Kumar M.N., arrested by the CID (crime) yesterday, were produced in the court today. The prosecution had sought 14-day police custody on the grounds that it needed more time for interrogation. All accused appeared calm in the jampacked court of chief metropolitan Magistrate K.J. Upadhyay. Reacting to the arrest of three senior police officers in connection with the fake encounter, the party’s Politburo, in a statement, said the arrests were just the tip of the iceberg as there had been reportedly a dozen encounters by the Gujarat police since the post Godhra riots in 2002. It said, “The arrest of three senior Gujarat IPS officers for murder in a fake encounter of Sohrabuddin Sheikh reveals the lawlessness and the shocking state of affairs under the Modi government”. “The present arrests were made only because of the courage shown by the brother of the deceased to take the case to the Supreme Court, which ordered the Gujarat government to conduct a CID enquiry”. He was commenting on the threat posed by the LTTE following the second air attack by militants on Sri Lankan military establishments within the last one month. The LTTE’s yesterday’s air raid on Palaly military establishment in northern Jaffna peninsula left six soldiers dead and 30 injured, while during the March 26 air attack on the Katunayake air base, next to the international airport in Colombo, had left three dead and 16 injured. The Indian Navy has a naval air base at Uchipalli, 640 km from here and south of Rameswaram, which is the closest point in India to Sri Lanka and Jaffna, the base of LTTE. At present, there is only an air strip there for helicopters to land but by next year it will be a full fledged naval air station as the Ministry of Defence is expected to clear the proposal soon. All seven naval detachments on the Tamil Nadu coastline will also be equipped with nine radars to detect intrusion into the Indian air space. Vanhaltren said sea patrolling by the Indian Navy in the Gulf of Mannar and Palk Bay has become comparatively easier as a 45-day ban on fishing by mechanised boats and trawlers was in force. The ban has been imposed by the Tamil Nadu government as it is the breeding period for fish in the area leading to only hundreds of boats fishing instead of thousands. This has made the Navy's task easier as Sea Tigers, the LTTE’s naval wing, do enter Indian waters in the garb of fishermen without arms and visit uninhabited islands inside the Indian Maritime Boundary Line. “As such, the cases of infringements across the IMBL are lesser. Only small boats are fishing in the area, which is advantageous from the point of checking vessels in the sea,” he added. Vanhaltren observed that over the last few weeks the influx of refugees from Sri Lanka had suddenly stopped. Vanhaltren said the Indian Navy was closely monitoring developments in the sea in and around the LTTE-held Jaffna peninsula in Sri Lanka following the recent developments. Other issues like price rise, internal security, finance minister P. Chidambaram’s foreign visit and Jammu and Kashmir will also figure prominently in the session. It will also have a special discussion on the judiciary’s role. The discussion will take place in the backdrop of the Supreme Court’s refusal to vacate stay on the law providing for a 27 per cent quota for OBCs in elite educational institutions. Lok Sabha Speaker Somnath Chatterjee announced the advancement of the discussion on the Finance Bill, which will now come up for approval on May 3, keeping in with a decision of the all-party meeting convened by him today. The human trafficking case and some others can generate friction between the treasury benches and the Opposition, with the BJP demanding that all such issues be taken up by the Ethics Committee. At the meeting the BJP and Left parties protested over P. Chidambaram’s foreign visit from May 6-10 when Parliament would be in session. The BJP is going to seek an explanation from Prime Minister Manmohan Singh on Pakistan Foreign Minister Khurshid Mehmood Kasuri's statement that a settlement on the Kashmir issue was on the cards. The Opposition has already given notices for discussions on several issues, including suicides by farmers and the Quattrocchi affair. Concluding a day long tour of Unnao and Rae Bareli by addressing a mammoth public meeting at the Jyotiba Phule stadium in Chowk, Sonia Gandhi equated the Congress to caring parents. “Like parents we consider all our children to be equal. Yet we are duty-bound to take special care of the child who is weak. Never trust those who do not believe that certain children do need special attention”, she told a cheering crowd. The majestic Jama Masjid of the Bara Immbara forming a picturesque backdrop, a happy Gandhi waved at the impressive turnout pleading to the Lucknow voters to turn their support into votes on the crucial voting day by sending a strong political message across the country. The city is going to vote during the fifth phase on April 28. She did not spare any political party in the electoral battle field. Without naming any specific party, she warned the voters against the three major political opponents. Gandhi said while one was dividing the country on the basis of religion, the other was seeking power by exploiting the poor and oppressed, while the third so-called “samajwadi” had set an example in criminalisation and corruption. Recalling the “tehzeeb” for which the city was famous across boundaries, Gandhi said it had a glorious history during 1857 and even later in the freedom struggle. “The state, which set the pace for development in the country in the early years under the Congress leadership, has been run by leaders who only filled their and their families coffers during the past 18 years and pushed the state into the deep ditch of misrule”. Promising to end the stagnation of the state if voted back to power, Sonia said without a supportive state government even central funds of NREGP, JLNURM and Sarv Shiksha Abhiyaan were not reaching the people it was targeted at. As union minister for steel Akhilesh Das was delivering the welcome speech, while Sonia was personally taking notes in consultation with UPCC president Salman Khurshid. Before ending her address she not only mentioned the names of the candidates but also thanked the entire Lucknow district team for organising such a remarkable show. Incidentally, this was her first public meeting in the capital city since 1999 when she addressed the voters in support of then Congress candidate Dr Karan Singh. City MP and former Prime Minister Atal Behari Vajpaye is also scheduled to hold his maiden public meeting in the city tonight. “Introduce me as Priyanka Vadra and not Priyanka Gandhi,” she said in an interaction with mediapersons during a road show here. Priyanka, daughter of former Prime Minister late Rajiv Gandhi and Congress President Sonia Gandhi, is married to Robert Vadra, a businessman hailing from Moradabad. She is repeatedly appealing to the people to vote for the Congress to secure the future of the children and for freedom from the politics of caste and hatred. “I used to visit this place as a child. Interestingly, today I have come here with my children. My long association with this place makes me proud,” she said addressing a crowd in Dih village. The image managers of both Priyanka and Rahul Gandhi are using this election campaign to present them as mature leaders able enough to take up important responsibilities. “These assembly elections mark the evolution of this generation of Gandhi family and much more is to come,” said a Congress source. The subsidy for Haj pilgrims’ air travel had mired in controversy with the Allahabad High Court’s Lucknow Bench by an order in August 2006 that restrained the Centre from granting it. But the apex court had stayed the order on the Centre’s appeal against the HC order and permitted the government to grant it for the year 2006 as an interim measure till the appeal is finally decided. Since the apex court has not been able to decide the appeal till date, solicitor general G.E. Vahanvati today made a special mention before a Bench, headed by Chief Justice K.G. Balakrishnan about the filing of an application for permitting the Centre to release the subsidy for 2007 also as the matter was sub judice. The court posted the hearing for May 7 on the application of the government. The HC had stayed the subsidy worth crores of rupees to Haj pilgrims on public interest litigation by B.N. Shukla, who claimed that it was discriminatory because such a relief was only being given to Muslims for their pilgrimage to Mecca every year, which was a private religious affair of each individual. But the government in its fresh application moved today, sought modification of the apex court’s September 18, 2006 interim order to the extent that the permission should be extended for December 2007 pilgrimage also. Though the Kailash Mansarover travel was not the issue before the HC, the Centre in its application said it has to release funds for travel arrangements of the pilgrims going there in June next and the pending case might come in the way. While the government bears the expenses on air tickets to 1 lakh Muslims every year for Saudi Arabia, the court was informed that it spends nearly Rs 3,250 per person for the Mansarovar pilgrimage. It said the negotiations for the Haj pilgrimage has already commenced and as the case was not decided by the court, it would be difficult for the government to discuss the travel arrangements. Telecom operators may face a penalty of minimum Rs 1,000 for each unverified subscriber, communication and IT minister Dayanidhi Maran said here today. ''We will impose Rs 1,000 penalty per subscriber on telcos for the non-compliance of TRAI's order for verification of customers identity,'' Maran told reporters. He said, a sample survey had been done for gauging the performance of various telecom operators. Reliance and Hutch had shown a good response verifying 93 per cent of their customers followed by Bharti with 90 per cent. State-owned BSNL had cleared 86 per cent of their verifications while Spice telecom and Tata Teleservices had done pretty badly, he said. As many as 17 new members will be inducted tomorrow in the first expansion after the Congress government took over in May 2004. The swearing-in ceremony will take place tomorrow at 7.45 am at the Raj Bhavan, according to official sources. As the present lot of 23 ministers will not be disturbed, the Andhra ministry will be 44-strong after the much-anticipated expansion. Reddy is probably the first Congress Chief Minister of the state who ran the government for such a long period with such a slim ministry. Many districts in the state, including the capital city of Hyderabad, had no representation in the Reddy Cabinet. Several important districts such as Karimnagar, Chittoor, Mahbubnagar and Adilabad had no members in the state Cabinet. Not surprisingly, the lion’s share has gone to MLAs from Telangana. As many as eight ministers out of the total of 17 are from this region, which has become a political hot potato for the ruling party in the wake of separate state movement. The legislators from Telangana have been waiting in the wings to join the Cabinet, following the vacancies that arose when Telangana Rashtra Samithi ministers resigned in July 2005. Another interesting feature of the expansion is that the Chief Minister has left no room for dissidents, who have been criticising his government at every opportunity. Senior leaders such as U. Purushottam Reddy and P. Janardhan Reddy have been left in the cold, even while accommodating their rivals from their respective districts. Despite many claimants from the recently revived Legislative Council, Reddy has confined his exercise only to the Legislative Assembly. The demand for a deputy chief minister from Telanana, raised by many leaders from the region, appears to have been brushed aside by Reddy, who opposed the idea tooth and nail during his discussions with the party high command. The meeting, to be chaired by union home secretary Madhukar Gupta, will be attended by chief secretaries and directors generals of police of the affected states, a press note from the ministry of home affairs said here today. Senior officials from various central ministries and departments will also participate in the meeting to take a holistic view of the matter. Tomorrow’s exercise comes close on the heels of the meeting of the Inter-Ministerial Group (IMG) at Patna and that of the Naxal Task Force at Hyderabad earlier in this month. The IMG meeting took a close look at development issues as the government considers Naxalism is not merely a law and order problem and has deep socio-economic dimensions. Against this backdrop, the Centre funds the Backward Districts Initiative (BDI) programme to fill critical gaps in physical and social development in areas hit by Maoist violence. Funds for development in these areas are given under the Backward Regions Grant Fund (BRGF) Scheme. The IMG meeting took place barely two days after the meeting of the home ministry's task force on Naxalism in Hyderabad, where the agenda included joint strategies to tackle Naxals, modernising intelligence gathering, and improving inter-state coordination to meet the target of eliminating the menace in the next three years. The Naxal-hit states are Andhra Pradesh, Maharashtra, Karnataka, Tamil Nadu, Chhattisgarh, Jharkhand, West Bengal, Madhya Pradesh and Orissa. The MHA has said in a report that the shift in Naxal strategy is in terms of increased militarisation, multiple attacks, mobile warfare and effective use of improvised explosive device and landmine blasts by Naxalites causing high casualties. The data available with the Home Ministry reveals that the Naxalites, who mostly use improvised explosive devices (IEDs) and landmines, killed 521 civilians and 157 police personnel in 2006, against 524 civilians and 153 policemen in 2005. The Naxalites are also intensifying their efforts at social mobilisation through a large number of front organisations under the banner of the People’s Democratic Front of India. “Within a few days we will see the wage board is in place,” he told reporters here. The Union Cabinet had approved a proposal for setting up wage boards for journalists and non-journalists on December 18, last year. Fernandes said there might not be any further delay as necessary action had already been taken. Addressing newspersons ahead of the 41st session of the Indian Labour Conference to be held here on April 27 and 28, the minister, however, parried a direct reply on the probable interest rate. He said it would depend on the quantum of money in the EPF coffers. But, a decision will be taken soon. He said the government would bring in legislation to provide social security to over 370 million workers in the unorganised sector in the second phase of the Budget session of Parliament beginning tomorrow. “We will introduce the unorganised workers Bill, 2006, in this session,” Fernandes said. Chief information commissioner Wajahat Habibullah and information commissioner O.P Kejriwal reserved the order after hearing the pleas from the government and Sikri, who has been superseded by Menon. During the hearing, the PMO refused to part with the information sought by Sikri on the ground that the file notings regarding the appointment of the Foreign Secretary are not covered under the Right to Information (RTI) Act. The CIC, however, observed that there should be no harm in disclosing such information. “The entire issue is in public domain,” he said. The Cabinet Secretariat also opposed disclosure of information on the appointment process of the foreign secretary and argued that Cabinet papers were immune under the RTI Act and should not be put in public domain. “I would have appreciated it and definitely added to the sense of the roundtable,” Qayoom told The Tribune here this afternoon. Qayoom, who once headed the Pakistan Kashmir cell, insisted his grievance was that he was not invited even though he was in the Capital. “Had I been invited it would have sent a strong message to the separatists who are boycotting the roundtable conference on J&K,” he observed. On the Indo-Pak peace process, Qayoom believed there is some improvement but a bit slow because of the circumstances. Panther’s Party chief Bhim Singh, who had invited Qayoom for the upcoming second conference of the “Intra J&K Heart to Heart Talk”, said he had conveyed the POK leader’s sentiments to the Prime Minister who responded with a smile. The first Intra J&K Heart to Heart meeting was held in September 2005 both in Jammu and Delhi. The saffron party whose earlier demands like the imposition of President’s rule in Uttar Pradesh and the execution of Parliament attack convict Mohammad Afzal were rejected by several of its allies did not even raise the issue of a debate during the NDA meeting held at former Prime Minister Atal Bihari Vajpayee’s residence. The issue did not figure at the NDA meeting, a NDA leader said on the condition of anonymity. The RSS has been raking up the issue for sometime now and has been criticising the RBI for using crossed lines as a motif on Rs 2 coins. Under pressure from the Sangh parivar, the BJP had declared that it would seek a debate in Parliament over what it suspected to be resembling the Christian religious symbol. The BJP said the RBI should instead have used the Ashok Chakra or Satyamev Jayate on the new coins it issued recently. Sources today said the Delhi police had seized documents, proving that BJP MP Babubhai Katara’s aide G. Rajendra Kumar, who was already arrested, had booked air tickets in the name of Katara, his wife and two sons on April 3 to fly from New Delhi to Toronto on April 13. Casting new light on the emigration racket, a senior official said that six of the 12 had travelled with Babubhai Katara, the Bharatiya Janata Party (BJP) MP whose arrest last week unravelled the scam. This information was provided to the police after they contacted the US embassy and the high commissions of Britain and Canada here through the ministry of external affairs (MEA). Special trains will also run from Kolkata to Darjeeling, Puri, Chennai and Pondichery during summer holidays. The MoU is aimed at providing consultancy for geo-technical investigation and related design works for tunnels for the Jammu and Kashmir project of Konkan Railway Corporation Limited.